Is the Dead Sea dying? The water levels in the Dead Sea - the deepest point on Earth - are dropping at an alarming rate with serious environmental consequences, according to Shahrazad Abu Ghazleh and colleagues from the University of Technology in Darmstadt, Germany. The projected Dead Sea-Red Sea or Mediterranean-Dead Sea Channels therefore need a significant carrying capacity to re-fill the Dead Sea to its former level, in order to sustainably generate electricity and produce freshwater by desalinization. The study, published online this week in Springer's journal, Naturwissenschaften, also shows that the drop in water levels is not the result of climate change; rather it is due to ever-increasing human water consumption in the area. Normally, the water levels of closed lakes such as the Dead Sea reflect climatic conditions - they are the result of the balance between water running into the lake from the tributary area and direct precipita-tion, minus water evaporation. In the case of the Dead Sea, the change in water level is due to intensive human water consumption from the Jordan and Yarmouk Rivers for irrigation, as well as the use of Dead Sea water for the potash industry by both Israel and Jordan. Over the last 30 years, this water consumption has caused an accelerated decrease in water level (0.7 m/a), volume (0.47 km³/a) and surface area (4 km² /a), according to this study. 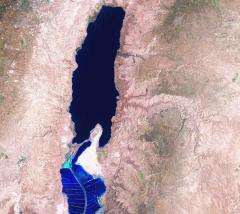 Abu Ghazleh and colleagues developed a model of the surface area and water volume of the Dead Sea and found that the lake has lost 14 km3 of water in the last 30 years. The receding water has left leveled sections on the lake's sides - erosional terraces - which the authors recorded precisely for the first time using Differential Global Positioning System (DGPS) field surveys. They were able to date the terraces to specific years. The authors point out that this rapid drop in the level of the Dead Sea has a number of detrimental con-sequences, including higher pumping costs for the factories using the Dead Sea to extract potash, salt and magnesium; an accelerated outflow of fresh water from surrounding underground water aquifers; receding shorelines making it difficult for tourists to access the water for medicinal purposes; and the creation of a treacherous landscape of sinkholes and mud as a result of the dissolution of buried salt which causes severe damage to roads and civil engineering structures. To address the mounting stress on water resources in the Dead Sea basin and the environmental ha-zards caused by its lowering, the authors suggest that the diversion of Jordan water to the Mediterra-nean coast could be replaced by desalinization of seawater, causing the recession of the Dead Sea to be considerably slowed, and buying time to consider the long-term alternatives such as the Red Sea-Dead Sea Channel or the Mediterranean-Dead Sea Channel. The authors conclude that either of these channels will require a carrying capacity of more than 0.9 km3 per year to slowly fill the lake back to its levels of 30 years ago and to ensure its long-term sustai-nability for energy production and desalinization to fresh water. Such a channel will also maintain tour-ism and potash industry on both sides of the Dead Sea.